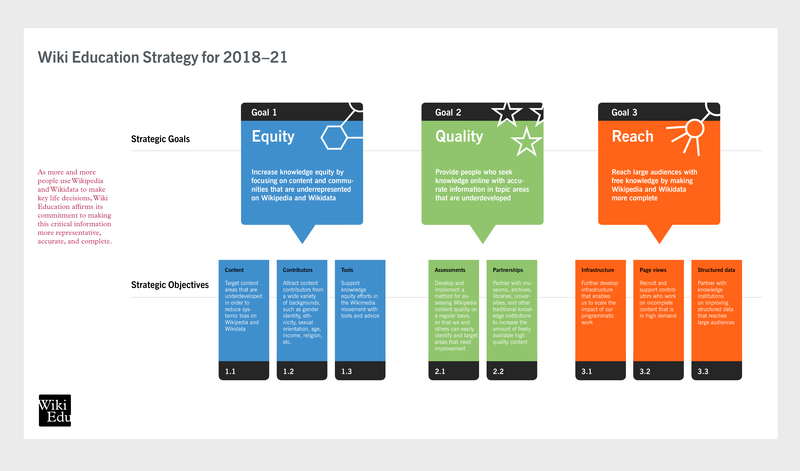 At its meeting earlier this month, Wiki Education’s board officially adopted our new strategic plan for the next three years, focusing on three strategic priorities: Equity, Quality, and Reach. Our new strategy comes at a time of change in the digital world. The instant availability of knowledge on our desktops, laptops, tablets, or phones has revolutionized the way people consume information. With the advent of digital assistants like Alexa and Siri playing a growing role in people’s lives, the way we access factual information is changing even further. While many people are still consulting long-form encyclopedias like Wikipedia for information, the prevalence of digital assistants means Wikidata, the open repository of structured data, is also gaining importance. In crafting our strategy, we recognize that Wiki Education exists to make information readers find on Wikimedia projects representative, accurate, and complete. Since 2010, we have systematically improved Wikipedia content through collaborations with colleges and universities. Earlier this year, student editors who have enrolled in our program to systematically improve the factual accuracy of Wikipedia reached a critical milestone: since 2010, they have added more than 44 million words to Wikipedia, eclipsing the amount of information available in the last print edition of Encyclopædia Britannica. Starting this year, we will move beyond working solely with universities and seek partnerships with a wider range of traditional knowledge repositories like museums, libraries, and archives. In order to target underdeveloped content areas more precisely, we will develop and implement a method for assessing Wikipedia content quality on a regular basis. Taking the changes in how people access information into account, we will expand our work to also include Wikidata. In order to support the global Wikimedia movement’s focus on knowledge equity, we will make tech support for programmatic initiatives through our Dashboard platform one of our core responsibilities. Wiki Education’s new strategic plan is a culmination of a year-long process of collaboration between the board and staff of Wiki Education. We created three strategic priorities and eight strategic objectives that we will engage with in our new fiscal year starting July 1, 2018. Outline of Wiki Education Foundation Strategy, 2018–21. I couldn’t be more happy with the process that engaged staff and board in creating this strategy. Wiki Education’s staff and I are eager to get started in accomplishing the goals outlined in our new three-year strategy.